New York-based media artist Paul Pfeiffer exhibits recent video work in the Museum's Lobby Gallery. Pfeiffer's video installations explore the relationship of cultural icons to history, memory, and disappearance. Paul Pfeiffer was born in 1966. He lives and works in New York. In 1987 he received his B.F.A. from the San Francisco Art Institute, and in 1994 he earned an M.F.A. from Hunter College. In 1998 he graduated from the Whitney Museum of Art Independent Study Program. He has had recent solo exhibitions at the Project, New York; Kunst-Werke, Berlin; and the Duke University Museum of Art, Durham, North Carolina. This year he received the Bucksbaum Award from the Whitney Museum of American Art in New York. Wong Kar Wai’s In the Mood for Love, a film shot and edited in Hong Kong and Angkor Wat over a period of two years and released in the U.S. earlier this year, is one of the finest, most moving examples we have in popular cinema of the way silence closes in on us and seals our fate. Language not spoken, gestures not expressed—the complete or near absence of the standard tools of "communication"—determines the rhythm of the film, which is composed around the stops and starts framing an "impossible" love as well as the deeply mysterious intractability of the principal characters, who become, in every sense other than the physical, lovers. Lovers—Wong Kar Wai treats this term or concept as successfully and artificially and beautifully as the costumes worn in In the Mood for Love, or the ingenious sets inhabited by noisy gossips, or some woman crying in a far-off room while mah-jongg tiles are slapped down on flimsy card tables by much-too-busy landladies. In addition to being "in love," our movie lovers are detectives in the house of love: their respective spouses are having an affair. What, our on-screen lovers wonder, must that be "like"? Their imaginations can only fill in the blanks left by their spouses’ deceit. The only truth they recognize in what is essentially a philosophical proposition—what does infidelity mean, or for that matter, what does fidelity mean?—is themselves, of course, and the terrible knowledge none of us can face: love doesn’t fill absences but deepens them. 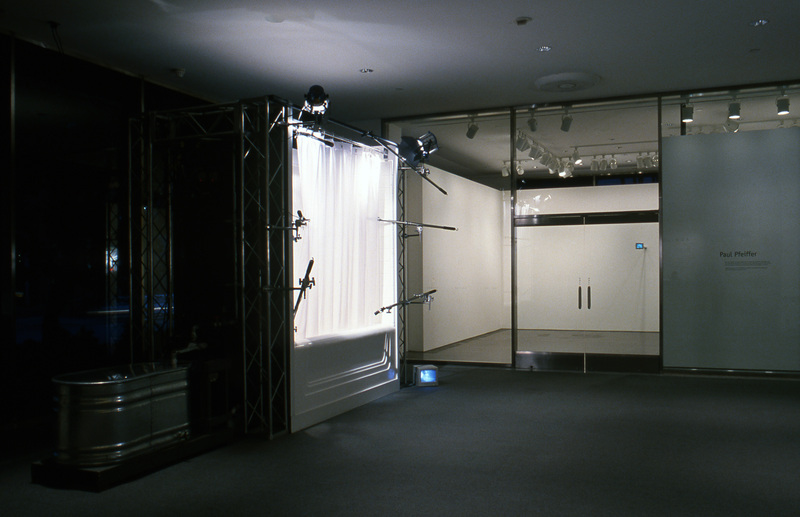 One can feel the deepening of love—and the holes left open by need—in Paul Pfeiffer’s work, which, altogether, bears some resemblance to In the Mood for Love in that the central trope in his videos and installations is not, as is often said, the spectator’s gaze, but the spectator’s desire, those eyes and hearts that cannot be filled up, despite the excess of crap produced to that end: movies, Marilyn Monroe, the "shock" of the toilet flushing in Alfred Hitchcock’s brilliant film Psycho, boxers dancing in a ring, intending harm—spectator sports all. "The roses seriously intend to grow says the gaze . . . / Oh, tell me the truth about love," W. H. Auden wrote. In his recent work Pfeiffer deepens his exploration of what Shakespeare meant when he asked, "Who is the slayed? Who is the slayer? Speak!" In The Long Count (I Shook Up the World) (2000), Pfeiffer has created a tape loop, shot in beautiful black-and-white, that "shows" a boxing ring with an audience around it. The focal point is the ring; the camera travels back and forth, steadily, over the ring, the audience. The crowd is the body we watch. The faces in the crowd are the spectacle. The audience’s focus "slays" the viewer of this piece, just as the boxers who have been absented from the ring are "slaying" one another—we think. Their absence, Pfeiffer’s technological disappearance of boxing glove against boxing glove, flesh against flesh, man against man, acts as a conduit to our stale, trained imagination, by which one can only mean that we are so familiar with what we watch that it takes no time at all to imagine it. But what are we imagining when we watch Muhammad Ali’s ghostly presence—at least in our imagination—fight? Colored skin? His poem-spouting mouth? Our bodies identifying with his physicality, but at a remove, since he’s not us but merely lending himself to our imagination, like any other star? Again and again, Pfeiffer queers our imagination by leaving the canvas of his work blank, so to speak. Take, as another instance of how disappearance resonates, the poetics of his not entirely blank space in 24 Landscapes (2000). The pieces show an absented Marilyn Monroe, cavorting, projecting pathos, in landscapes. There she is, and there she isn’t: we see her because we know Marilyn Monroe when we see her, but then again Monroe is a natural phenomenon made distant from her naturalism by the artificiality of presentation one must embrace in order to be a star. Pfeiffer removes all precepts of stardom by removing the star. Janet Leigh in Psycho. She too is a memory in Self-Portrait as a Fountain (2000). 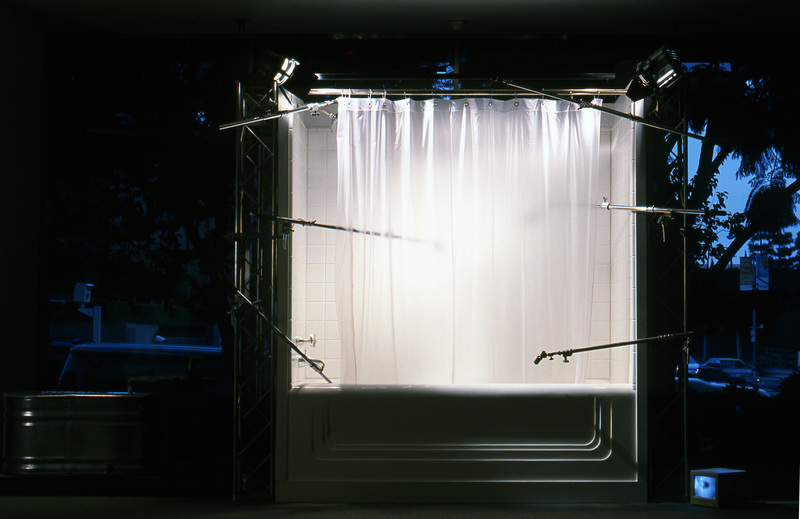 Taking the famous shower scene as its central metaphor, the piece has tiled walls, a plastic curtain, a running shower, and rods indicating the angles made famous by the piece’s original creator: Alfred Hitchcock? Or Janet Leigh? Or Anthony Perkins in drag? Each contributed to the fame of the metaphor Pfeiffer has chosen, and yet one could never say who the author of this moment is. We remember the shower scene for a number of reasons: Janet Leigh’s tawdriness, Anthony Perkins’s wig, Hitchcock’s "eye." Each of them together or separately "slays" the audience. Pfeiffer underlines the issue of authorship in the piece’s title. If this is a self-portrait, where is the artist? In the water? The tiles? The curtain? Is he in love with a gay artifact, and if so, which one? Anthony Perkins in his wig or Janet Leigh in her bra or that daddy of the cinema, Alfred Hitchcock, who put himself in every film he created? Pfeiffer erases Hitchcock’s penchant for cameos by turning to a Duchampian model here: the artist is everywhere and nowhere in this self-portrait, which resembles love: distant and ever-shifting and having very little to do with the beloved. Pfeiffer is intent on not telling us who he is, even as he engages in a lyrical didacticism that tells us, over and over, precisely who he is: another spectator in love with absences that cannot be filled up, in Hong Kong, or Angkor Wat, or New York, or on Marilyn Monroe’s lips. The true definition of the romantic: one who does not want any of his desires met, and who lives to wear nearly everything on his sleeve, the better to show off his prideful loneliness. Hilton Als is a staff writer at The New Yorker magazine. He is the author of Don't Explain, a film project with the artist Darryl Turner.